It was a frustrating Sunday for many Best Buy customers who were expecting to walk out of the store with a brand new Apple iPad 2 and instead walked out without the new tablet. 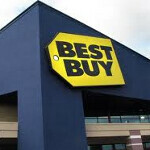 A leak of a Best Buy internal memo revealed that the big box retailer was planning a big Apple iPad 2 promotion for Sunday, April 17th. The memo was issued in response to speculation that Apple had "blacklisted" future shipments of the iPad 2 to Best Buy because of a sales dispute. Following the the memo, the Apple iPad 2 was pictured on the front page of last Sunday's ad with a notice that there would be no rain checks except in Michigan and Ohio where Reserve Tickets were issued instead. In both of those states, each store had a minimum of 3 units in inventory. With the iPad 2 predominately featured in Sunday's ads, the retailer switched to a "reserve order system" which means that those whom reserved a tablet would have first crack at the inventory in the store. Reserved orders have first priority and once those units and any additional inventory are sold, the store starts taking reserve orders for the iPad 2. This system will be in place for the entire week of the ad. Customers have 48 hours to claim any pre-ordered tablet once it is in the store. Best Buy had an idea that inventory was going to run out. In the memo, it said, "Corporate Support Teams know that many stores won't be in the optimal inventory situation or have available units to meet our customers' requests for this ad. It will be critical that stores have their current reservation(s) worked through and execute any new reservations effectively to take care of as many customers as possible." Yet, Best Buy did choose to feature the device this past weekend. While some Best Buy customers were indeed shut out from buying an Apple iPad 2, the good news for Best Buy employees is that they are now allowed to purchase the device from the store. This is not telling the complete truth. In reality Best Buy store haven't had any Ipad 2's since launch. I work in a SAS and ever since the first day, we haven't had a single shipment. We even check locations in our area daily and nothing. The funny part to all this is that the Apple stores have stock daily. I know this as I work down from one. They are filling their pockets first and then they will let them out through time. Trust me, I have hundreds of customers checking into my store daily for if we have Ipads. They do this with all products. From the Iphone, to Ipods, to Ipads. It marketing strategy for them supply and demand. Don't get pisses at retailers for not having them. Its not their fault. It comes down to how greedy Apple really is. I have to agree with you! The only reason Best Buy doesn't have it is because the supplier is not supplying the product. Best Buy's shortage is due to Apple. My neighborhood Apple store never runs out. It has a mini factory in the back constantly making them. No, but I think you get my drift! It’s funny how the Apple store is bursting with product but nobody else has any. What a coincidence! I don't know that I necessarily agree with this. While I am unsure what the Best Buy inventory in the KC metro was yesterday, I can say without a doubt that the stores here (Target included) have had "regular" shipments of inventory. Do they get a lot? Absolutely not, and especially not what the two Apple stores here get, but they are getting them. Be happy employees can buy ipad 2....Verizon and ATT cannot purchase them from their employers. How is Apple greedy because they want to make $. Come on now, they still stand to make $ by allowing best buy to sell the product. I just don't understand your greedy logic. its not greed as much as "protect your own stores before supplying others". Its a new product. Of course if there is shortages they will make sure that they have it availible to their own direct suppliers before fufilling any 3rd party retailers. Would you really expect any different?? durka durka. sorry bud :( hope you find it, have you tried ebay? Thanks dude, I have one on order with Apple and should be shipping by the end of this month. My wife got hers a few weeks ago. I though I could find one before the shipping date and just cancel my order but no luck. It's bestbuy's fault that they don't recieve stock? Pretty common practice for them to advertise an item that may not be available at all stores. I bet if you read the fine print in the flyer it says that too. I know they always do here. What a bad article. qweqwr... What no designer ipads? So HERE'S an idea, Best Buy... ... ... ... SELL THE FREAKING XOOM INSTEAD. If Apple wants to try to squeeze your balls, just sell a competing product that measures up to it and sports an OS which kicks iOS clear out of the park. The Xoom isn't a good buy. Its over priced and needs lots of tweeking. If you decide not to go with an ipad, I suggest waiting a few months and see where the tablet wars go. 600 bucks for a wifi only model with the same internal memory as the iPad 2 wifi only model at the same price point? Why do people keep pulling out this "overpriced" argument?